Products derived from biocultural heritage, such as traditional foods and medicines, generate income for communities and provide incentives for sustaining genetic resources and traditional knowledge in the face of external pressures. Biocultural products can also improve communities’ health and nutrition. Traditional crops are often more nutritious and resilient than modern varieties, yet communities are often discouraged from sustaining them. Instead, extension services and government subsidies often favour higher-yield modern varieties. Communities are also dissuaded from sustaining traditional health systems. seed laws and traditional medicine laws which impose 'mainstream' certification standards which are very hard to meet. Yet new opportunities are emerging for biocultural products due to the growth in organic, herbal medicine and health food markets. These markets, already large in the North, and are also growing in urban centres in the South. Communities can use biocultural registers to help identify products with market potential. And with support, perhaps from an NGO intermediary, they can gain access to niche markets, for example through improved packaging and product information, by exploring and documenting nutritional content, marketing through food fairs, and identifying organic restaurants or supermarkets to supply. ‘Soft’ intellectual property rights can also help protect markets for biocultural heritage based products. Unlike patents and plant breeders’exclusive rights, soft intellectual property rights, such as collective trademarks and geographical indications, can recognise collective rights over traditional-knowledge based products and their links to territory and culture. In the Kalimpong area, drought-resistant millet varieties had become marginalised, despite their potential for adapting to climate change. But with improved packaging by women’s groups they have become very popular. With the help of community registers, other traditional foods with market potential are now being identified. They will be analysed for nutritional content and will benefit from market research. The plan is to promote them to urban consumers via the internet. ‘Geographical indications’ are being explored to protect farmers’ rights over these products. At the same time, the most nutritious varieties will be promoted within local communities, through local recipes, food festivals and seed fairs. 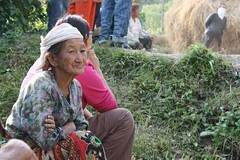 Ecoserve, an NGO based in Delhi, and the Centre for Mountain Dynamics (Kalimpong), are coordinating this project in collaboration with Lepcha and Limbu farmers. 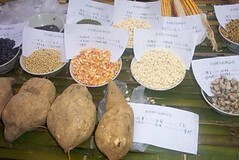 Example: Linking farmers to an organic restaurant in Guangxi, South West China. The Centre for Chinese Agricultural Policy has been working with Farmers’ Friend, a local NGO, to link farmers to an organic restaurant to supply traditional specialty foods. The project has set up several successful contracts between farmers from five villages and the restaurant (or the NGO intermediary). 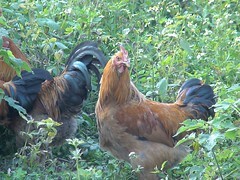 Farmers sell rice, maize, vegetables, eggs, and the Guangxi native chicken, which is famous for its distinctive taste. The restaurant only accepts landraces (ie. traditional varieties). Farmers are keen to work with the restaurant, and it helps them integrate a traditional and organic strategy into their farm management. The niche-market restaurant builds farmers’ and consumers’ confidence in local varieties and traditional knowledge. Its supportive pricing mechanism encourages farmers to maintain their varieties, traditional processing skills and traditional farming knowledge. Farmer associations working on organic food production are also encouraged. To differentiate with certified organic food, the restaurant uses farmer-produced traditional organic food certification. Mutual trust is the basis for certification. The six communities of the Andean Potato Park near Cusco, with support from Asociacion ANDES, have developed a number of biocultural products and services, managed by local collectives. Traditional medicines are packaged by the Park’s Medicinal Plant Collective, for sale locally. These medicines have the Park’s collective trademark logo on them, which was designed by the communities. A percentage from the sale of any product carrying this trademark goes into a communal fund for Potato Park activities. A project is developing ‘nutraceutical’ potatoes—traditional organic potatoes to be marketed as health foods, targeting supermarkets in urban centres. A scientist at Cusco University is analysing potatoes for their anti-oxidant properties. A traditional restaurant has been set up to serve traditional foods and recipes from the park, prepared by the park’s gastronomy collective. This is part of a wider strategy to promote small scale agro-ecotourism in the park, using local guides and homestay providers. 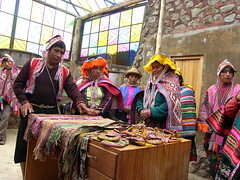 Other collectives develop weaving and craft products. ANDES plans to work with Quechua communities to identify names for branding novel biocultural products, and has developed legal proposals for protecting the Q’eros name and indigenous peoples’ names in Peru. Protection is needed because indigenous names have sometimes been used for product branding, thereby preventing indigenous people from using the brand names themselves. Example: Adding value to Mijikenda traditional products in coastal Kenya. The Kenya Forestry Research Institute is working with Mijikenda communities in Malindi, Kilifi and Kwale districts to add value to traditional food and medicinal products. The work is helping farmers and healers process, preserve, package, label, brand and market their products, in order to increase the market. 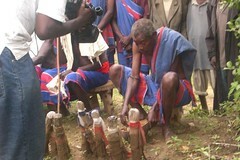 Marketing activities include holding cultural festivals and exhibitions and preparing audio-visual materials. Community groups plan to establish conservation groves around their traditional kaya forests to ensure a reliable supply of raw materials for biocultural products. Collective trademarks will also be registered to protect these products (so far, no trademarks have been registered under Kenya’s collective marks system). NEW! Intellectual property tools for products based on biocultural heritage, Graham Dutfield, Shaping Sustainable Markets Papers, November 2011.